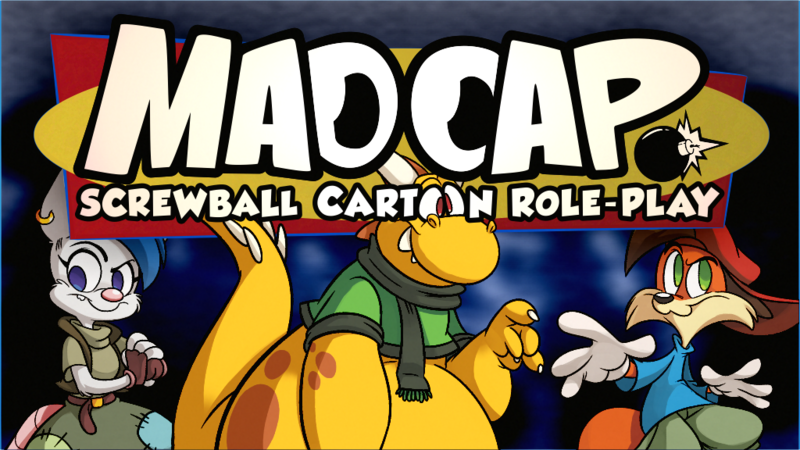 Sanguine Productions is proud to announce MADCAP: Screwball Cartoon Role-Play. Based on the popular Apocalypse World engine, this game of laughs, lumps, and lunacy is designed from the ground up to be a hilarious experience unlike any other. In a cartoon world of ridiculousness, it’s not about winning — it’s about failing forward. From the classic of Bugs, Daffy, Tom and Jerry… to the revival of Tiny Toons, Animaniacs, and Freakazoid … and even onto the post-modern takes of Spongebob, Adventure Time, and Regular Show… our game reminds you and yours what it was like to get together and laugh at yourselves. (And trust us — you’re really funny to laugh at!) We’ve assembled a dream team of cartoon historians, fantastic artists, and our usual gang of idiots… and we need your help to light this candle. MADCAP is now available for crowd-funding options. For a limited time, you can get exclusive artwork from animation professionals — your own cartoon character, immortalized in a role-playing game, the highest form of entertainment media! With your support, we can take this act on the road: new platforms, new stores, new artists, new novelty! Click here to spread the MADCAP lunacy. Sanguine Productions is proud to announce FARFLUNG: Role-Play at the Limits of your Tomorrow. 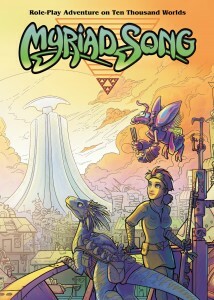 Based on the popular Apocalypse World engine, this high-concept science fiction game explores the possibilities of characters far, far more powerful than your typical role-playing game. From immortals beyond that transcend time, up to alien destroyers of entire worlds, and right down to the mostly-harmless Earthlings clearly in over their heads, you may immerse yourself in the experience of post-scarcity, transhuman space. But if anything is possible, then what is interesting? We have such sights to show you. FARFLUNG is now available for crowd-funding options, and we invite you to participate in more ways than ever before. Early-access copies are available for immediate review. (Yes, pledge right now and immediately receive a working copy of the game.) And with your support, we can take this experiment in interactive fiction to new heights, such as new platforms, retail release, story-telling tools and more. Click here to share and enjoy Farflung. Friend, have you been suffering from the listless feeling that doctors have been known to call “bad game”? 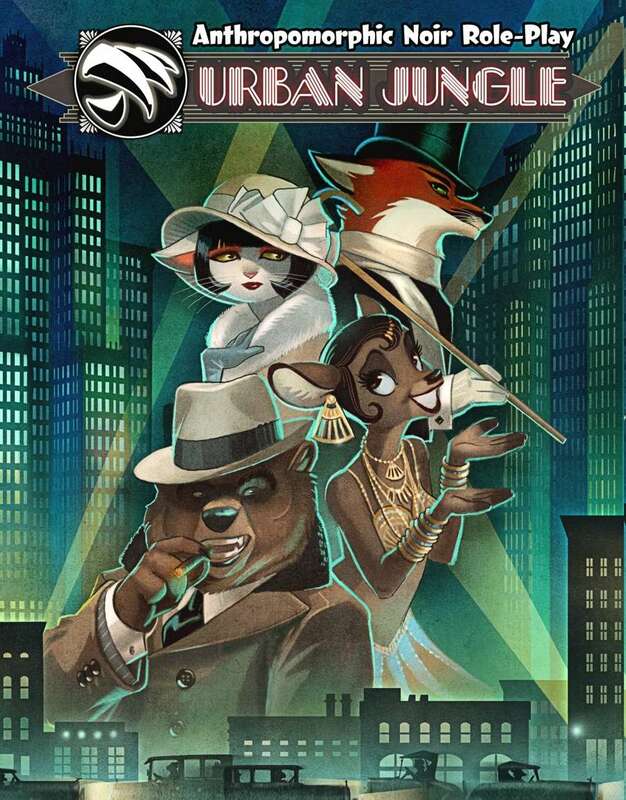 Well, “level up” your life with URBAN JUNGLE: Anthropomorphic Noir Role-Play! A stand-up, stand-alone game in a single volume, you too can take on the role of the hard-boiled detective, the scheming femme fatale, the two-bit crooks, and the high-rolling gangsters. Customize your character as little or as much as you like, then jump head-first into a rich world of animals that walk, talk, fall in love, hold grudges, and frame you for a murder you did not commit. Just like people do! 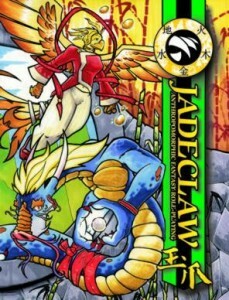 URBAN JUNGLE was engineered by the top game-scientists of Sanguine Games, the same ones who brought you Ironclaw, Albedo, Usagi, and other fine products. 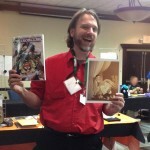 Then they added illustrations from such top-notch artists as Tracy Butler (Lackadaisy), Maritza Campos (College Roommates From Hell), Rick Griffin (Housepets), Adam Koford (Laugh-Out-Loud Cats), and Krazy Krow (Spinnerette). Finally, the game was produced by the support of community members like yourself, and now it’s available for everyone! To celebrate of this brave new world of modern gaming, the printed version of URBAN JUNGLE is on sale for a limited time at 20% off. Just click this link, here, to order your copy and to have it delivered by parcel post or by special delivery. This offer will be available until November 10, 2016 or while supplies last, so act now while there’s still time! URBAN JUNGLE. Ask for it by name! Back in 2013, we were finally able to realize our dream to bring you a science-fiction game unlike any other. And with the help of pledges from people like you, we were able to make the Myriad Song role-playing game a reality. 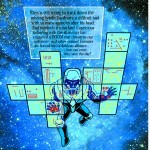 We were able to assemble a unique team of writers and artists, from the glory days of New Wave sci-fi to the modern era. Now is where the past ends, and the future begins. That’s right. There’s no crowd-funding, no pledge drive. The book is available for immediate sale, right now. The book that you helped make, available for a single click. 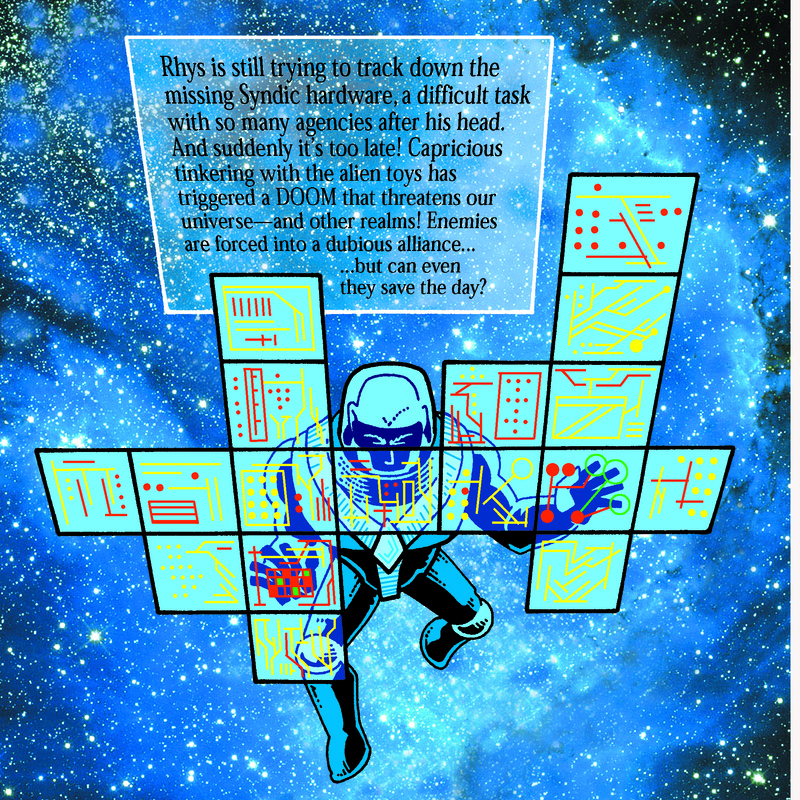 And a cavalcade of guest stars, as all cameo characters that appeared in a previous book have a return appearance in the pages of Myriad Doom. For a limited time, printed copies of Myriad Doom will be on sale for 20% off. You can order from OneBookShelf.com by tapping this link. 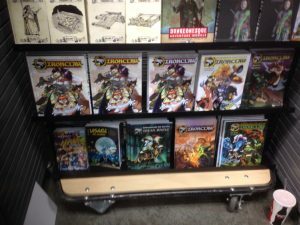 If you still need to get copies of the earlier volumes, too, bundles of Myriad Quest, Threat, and Doom are available in both electronic and print form. Are you new to the mysteries of the Ten-Thousand Worlds? Discover the unlimited adventure with the MYRIAD BOXED SET, which includes the Song starter game, the Aliens, expansion, and all three graphic novels. Available in both electronic and print form. It’s been your support that transformed these books from theory into reality. Thank you for believing in our dreams of fire and star-shine. Wow, that was an amazing turn-out at AnthrOhio, way past anyone’s expectations! Thanks to the staff for inviting us to speak at our panel, and thanks to the attendees who made the event a rousing success! 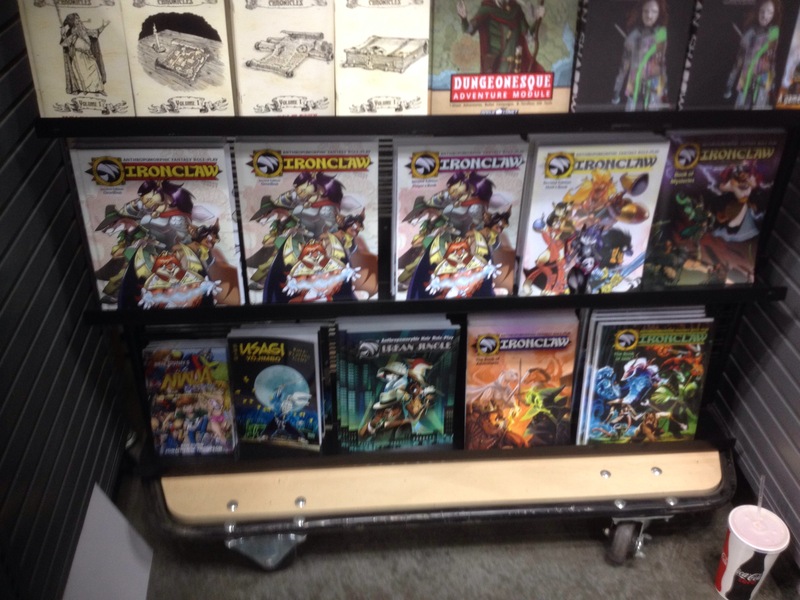 We’re sorry that we didn’t have enough merchandise on hand to meet all of your needs… So for a limited time, we’ll be offering the sold-out titles with convention discounts! You must use these links, below, to claim the discounts. These discounts are limited, so order now & before the convention buzz wears off! Sadly, these discounts have expired. Check back early and often for more offers! 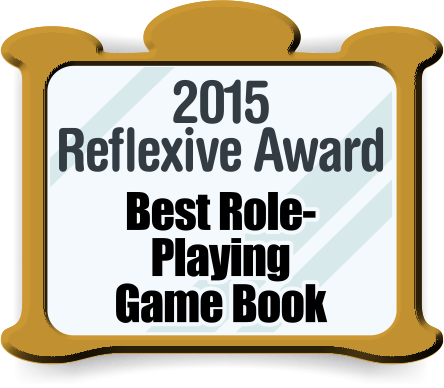 We are proud to announce that Book of Fools is the winner of the “Best Role-Playing Game Book” from the 2015 Reflexive Awards! This award, granted by a peer committee of our supporters, our publishers, and ourselves, is an accolade that only those with the greatest sense of worth in themselves can truly proclaim. Our greatest thanks to those who dared to look at the diverse tapestry of all other products in the field, and who then could come to no other conclusion that the best recipient was ourselves. You too can be prepared for all eventualities. The Reflexive Awards are the only awards granted to the entertainment and the arts that are not driven by a political, social, or conspiracy-fueled agenda… because you give the award to yourself. Click here to download your own 2015 Reflexive Award. Use the image editor of your choice to fill in what category that you’ve won. There’s no limit to the number of awards that can be achieved — with the Flexxies, we’re all winners. 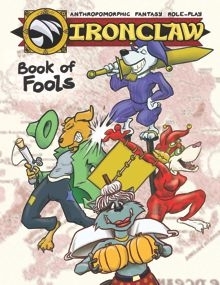 You can click here to order Book of Fools from DriveThruRPG.com. Celebrate our award by paying as much as you can! Every dollar you spend is a victory toward the cause. 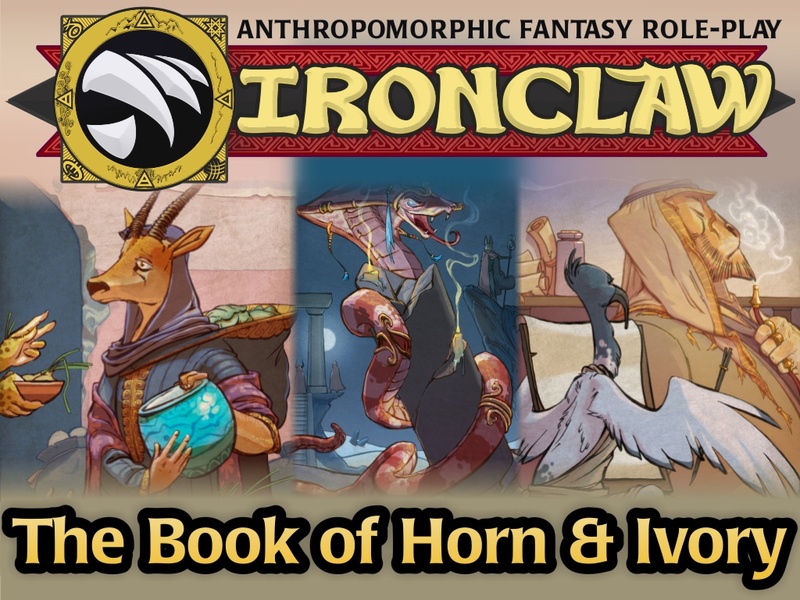 The long-awaited supplement to Ironclaw is finally entering production. The Book of Horn & Ivory details the mysterious land of Akoma. From the Anatolian Empire to the Deltan Queen-in-Exile, from the mysterious desert sands to the impenetrable jungles, from the underground tombs of long-dead kings to the tallest mountains that pierce the sky, a new world of perilous adventure awaits your heros. You can learn more about the Horn & Ivory crowd-funding on the Kickstarter.com website, by clicking here.